Presented by South India Fine Arts Association (SIFAA) at the National Art Gallery on April 6th, 2013, ‘Nrityamalika’, featured the Indian classical solo dance traditions of Bharatanatyam, Odissi and Kathak by three Australia based highly accomplished artistes – Aruna Gandhimathinathan (Bharatanatyam), Monica Singh (Odissi) and Shruti Ghosh (Kathak). SIFAA in Canberra, founded and steered by Mr. Gopal Krishnan has been contributing immensely in promoting Indian art and culture in Australia. Nrityamalika, was SIFAA’s attempt to move a step closer towards providing a truly multicultural view of the varied dance forms that emanate from India on the same platform. 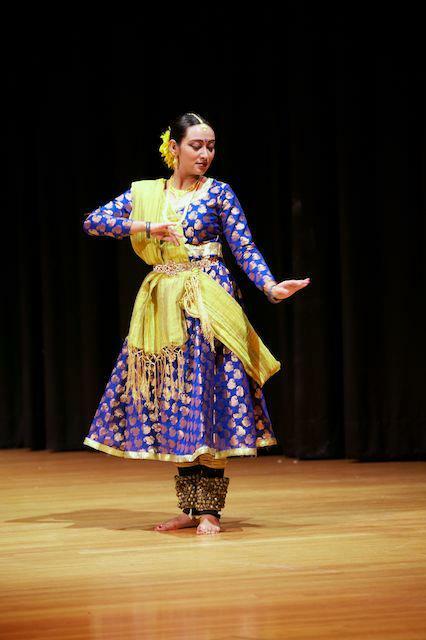 Kathak by Shruti Ghosh: Shruti Ghosh trained under Guru Sumitra Mitra in Jaipur Gharana style of Kathak began with an invocatory piece called Shiv Tandav. Shiva, the destroyer is also incarnated as Nataraj – the God of dancing. Impulse of creation, destruction and preservation are all symbolized through the Nataraj statue as has been indicated by dancers, scholars and researchers. Tandav which stands for valor, energy and (perhaps) a sense of awe on the other hand expresses the profusely creative impulse of dance that Shruti tried to convey through the piece. Her next piece was a Nritta or pure dance piece that explored the rhythm patterns and abstract movements of kathak. She chose a piece based on dhamaar Taal (comprising of 14beats) and ended with drut teentaal (comprising of 16beats). She then danced to a musical composition incorporating instruments like sarod, sitar, and tabla the Tarana. Shruti says ‘The idea was to engage and interact with the rhythmic musical patterns formed by the coming together of these instruments’. Shruti’s final presentation was an abhinaya (acting) piece based on a traditional and popular thumri composed by Kathak maestro Bindadin Maharaj. This particular rendition was sung by Kathak artist Pandit Birju Maharaj for the film Shatranj ki khiladi. The thumri describes one of those mischievous feats of Krishna where he is engaging in a playful dalliance with his beloved Radha as she goes on her way to fetch water from the river Yamuna. Kathak’s true fervour comes out in its entirety in the presence of live music where the dancer constantly interacts with the tabla player on stage bringing out a dialogic pattern within the performance. Shruti says ‘The absence of live music and reliance on recorded music therefore imposes certain restrictions on the dancer and alters the performance’. 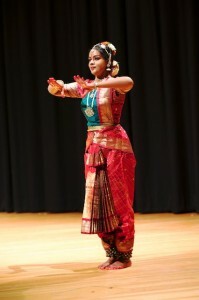 Bharatanatyam by Aruna Gandhimathinathan. Aruna commenced with ‘Ode to Australia’, a composition celebrating the beautiful land and people of Australia. 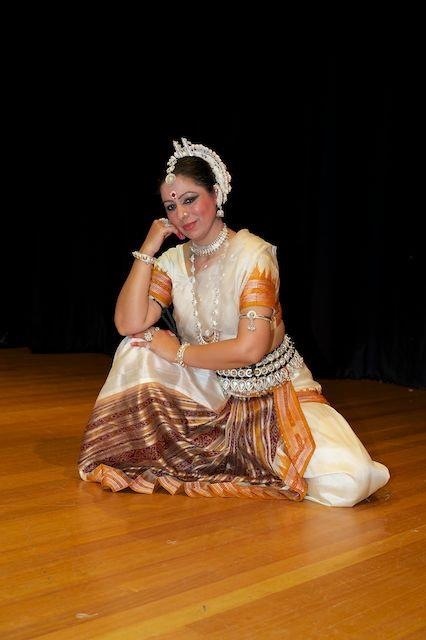 With lyrics composed in Sanskrit, by Dr. Meenakshi Srinivasan of Sydney Sanskrit School, Aruna has choreographed this song and presented it to a variety of audiences in Sydney, and now in Canberra. This was followed by ‘Jatiswaram’ in ragam ‘Rasali’ composed by Vidwan Madurai N. Krishnan and choreographed by Guru Prof. Sudharani Raghupathy. ‘Jatiswaram’ features ‘Nritta’, the rhythmic dance movements woven into sequences called ‘korvais’ set to a ‘raga’ or melody. Following this was an ‘Abhinaya’ piece, ‘Payinkili Vannan’ in ragam Thillang, which describes a beautiful episode where Andal, a devotee of lord Vishnu sends her pet cuckoo bird as a messenger of love to her lord. Aruna concluded with a Thillana in ragam Brindavana Saranga, a composition of Vidwan Madurai N. Krishnan, and choreographed by her Guru. Aruna says, “It was a lovely experience to present the art of Bharatanatyam to a very warm audience in Canberra, as part of Nrityamalika. It was also wonderful to share the stage with two very talented artistes – Monica Singh and Shruti Ghosh, my good friends, with whom I have previously worked on collaborative projects’. Odissi by Monica Singh – Odissi dance is a two thousand year old dance tradition from India. It traces its origins to the eastern coastal state of Orissa. Its roots are based in yoga. Though ancient it is modern and contemporary in its present evolution yet retains it spiritual and esoteric form. Monica Singh commenced with the Chayannaut Pallavi – The word pallavi evokes the feeling of a flower slowly blooming from a bud to a full bloom. Similarly when translated into the language of dance the dancer creates a mood of a visual poetry of movement slowly blooming in its abstract form sometimes deliberate imagery overtaking the musical pauses. The piece is abstract in form and set to Raag Chayannaut . The raag is a late evening raga hence the mood evoked through the music and the dance places it appropriately in the present time scale for maximum effect upon the dancer and the spectator. The dance is choreographed by Monica’s Teacher, Smt Madhavi Mudgal, the music is composed by Shri Madhup Mudgal , Taal triputa. Dasawtara – Odissi dance takes its strength from being an art form that has the story telling aspect at its core. The ability to tell a story brings forward the connection of a deeper building of human values, hope, faith and awe inspiring incidences from our mythologies. In Orissa Jagganatha is the residing deity, Jagganatha is also Krishna. The oriyas believe that Krishna or Jagannatha came upon the earth nine times in different avataras/ forms to save the earth from being overrun by evil demons. In this dance piece which is from the Gitagovinda of Jayedeva the poet invokes the blessing of Jagannatha by recounting the tales of his constant love for his devotees in the form of ten incarnations. “As the fish to uphold the four Vedas; Holding the nectar of life on your back as the glorious turtle giving freedom to the righteous; as the divine boar that rises from the depths of the cosmic waters to save the Earth; as the Half Man Half Lion Narasimha to save devotee from being killed by his powerful demonic king father; as the cunning midget Vamana you crushed the overzealous pride of Bali; as Parsurama the Brahmin warrior you freed the earth of greedy Kshatriyas and their blood spilling wars; You came upon this earth as the righteous Prince Ram even as the ten headed Ravana was slain by your arrow you blessed him and he attained moksha; as the agriculture promoting brother of Krishna Balaram you tamed the mighty rivers and bend them to give waters to the growing fields of settled humanity; as the gentle Buddha; as the tenth avatar as the Kalki, comet like on a white horse holding the fiery blazing sword of light you will come again and hold up the balance of life on earth. Moksha – The word Moksha literally means the end of the cycle of birth and death . The dancer by the end of the evening reaches a state of inner quietness. A feeling of oneness within . This quietness gives rise to the feeling of the ending of a cycle. Moksha is set to rhythmic beats. Based on abstract movements with cyclic symbolism. It ends with a shloka to the Divine Goddess Narayani .